Cozy Mysteries having the own special place. I love my Recommendations Page. Lori at Lori’s Reading Corner takes a different approach. She has a post every so often that helps us to keep track of the mysteries coming in the future. You can read her “Mark Your Calendars” from September 15th here. She has earned the title “Book Pimp” for a very good reason. Lorna Barrett/ Lorraine Barlett had a Facebook post this week that was a great reminder. Room at the Inn has been out a week, and many people have written to tell me how much they loved it, but not one person has written a review on the Amazon or Barnes & Noble websites. Please consider doing so. Thank you! Writing a review on Amazon.com and Barnes and Noble.com and Goodreads is so easy and helps the author so much. You do not have to be a blogger. Reviews on Amazon just need to be at least 20 words long. A simple I liked this book because…. is so easy. The words don’t have to be fancy, just a few words can help readers make decisions whether to purchase a book or not. 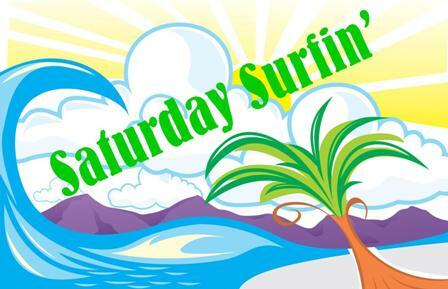 That’s it for the first Saturday Surfin’. If you see some posts you feel should be shared please leave the links in the comments section for people to visit. The weeks are too short to travel to all the wonderful blogs in the blogosphere but together we can help find and direct each other to at least a few.